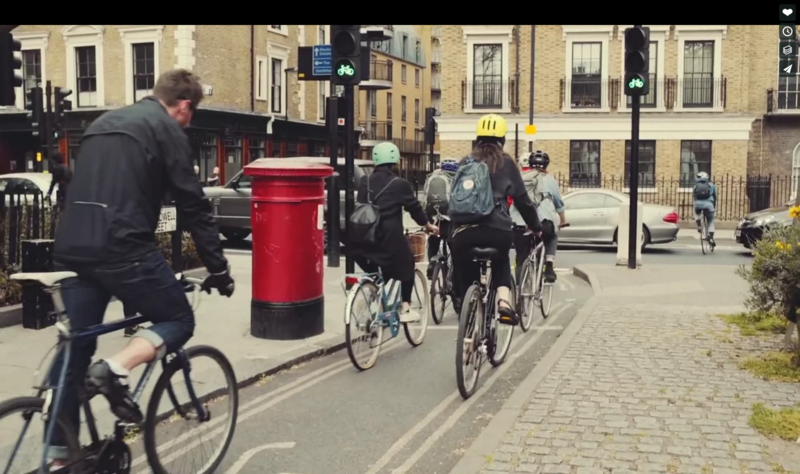 First in a series of speculative design films from the Future Cities Catapult, this film is centred around challenges for the urban cyclist in London. The film “New User Experiences for Cycling” contained five prototypes based on existing or near-future technologies, which could help solve issues for the cyclist such as wayfinding, safety or air quality. Exploring London’s existing cycling infrastructure we uncovered use cases where people find it difficult to navigate the city. One issue was the uncertainty around what is a cycle path and what isn’t. We explore how augmenting the routes using connected technologies may ease journey pain points and help people get to their destinations sooner. I worked alongside the Urban Futures team to provide technology landscape research and analysis around wearables, in-situ technology and street furniture, IoT systems, and related datasets, which fed into the speculative prototypes generated for the film. Aided the production process by designing and printing 3D props and prototypes for use during shooting. Also presented and provided voice-over for the film. Featured in Dezeen, Wired, Guardian, Business Insider, Next City, Intel iQ and many more.